I suspect the hidden cause of many a failed recipe is bad ingredients. Not bad as in ‘spoiled’ or ‘expired’. Bad as in low-quality or the wrong ingredient (using self-rising flour instead of all-purpose flour, for example). I admit when I started cooking- with my sense of thrift- I went for cheaper ingredients. I’ve stopped that. And everything tastes better. In addition, once I took the time to learn how ingredients interacted with each other, the entire process of cooking/baking was easier. – Chocolate: Cacao, Cocoa, Baker’s Chocolate, Etc. – Leavening Agents: Baking powder, soda, yeast, etc. Chocolate: Cacao, Cocoa, Baker's Chocolate, Etc. If you are interested in the process of making chocolate, check out the original blog post “All About Chocolate“. Buttermilk: thick and creamy cultured milk with a mild acidic tang. (It was originally the liquid left over from the churning of the butter [churn buttermilk], though it is mostly produced by different means today [cultured buttermilk]). Clotted cream (breakfast cream): contains minimum fat content of 55%, ranges up to 64%. Produced by indirectly heating (steam or water bath) full-cream milk and then allowing it cool naturally in shallow pans. The clots that form on top are the “clotted cream.” Generally used in the Britain. Cream cheese: contains 33% milk fat (in U.S.; other countries may require higher percentage). Fresh cheese made from cream. In many recipes, the fat in the cream cheese is vital to the end product, so substituting lower fat or non-fat cream cheese should be done carefully (or not at all). Creams: higher butter-fat layer skimmed from top of milk. Sometimes called sweet cream to distinguish it from whey cream used in cheese-making. • Half & Half: blend of whole milk and cream. Contains between 10.5% and 18% milk fat. Cannot be whipped. • Light cream (coffee cream, table cream): Contains between 18% and 30% milk fat; usually in the range of 20%. Cannot be whipped. • Light whipping cream: Contains between 30% and 36% milk fat. Can be whipped (higher fat content, easier to whip). If a recipe calls for light whipping cream, heavy whipping cream may be used. However, if a recipe specifies heavy whipping cream, that is what may be used. • Heavy whipping cream (heavy cream): contains between 36% and 49% milk fat (according to American requirements…generally on the lower end of that spectrum). Can be whipped (higher fat content, easier to whip). • Double cream: contains 42-48% milk fat. Only available in Europe. -Notes: Ultra-pasturized versions of these are most common…but don’t whip as well and can have a slight “burnt” aftertaste. Finding “regular” pasteurized versions is becoming harder, but the taste is better. Above percentages are U.S. requirements; they vary by country. Ultra-pasturized heavy cream may “not work” if frothing or stiff peaks are required. Milk: the fat in milk contributes to structure of baked goods; differences in fat content (2% versus whole, for example) will result in differences in flavor and texture. • Whole milk: 3.5% milk fat. • 2% milk: 2% milk fat (obviously). • 1% milk: 1% milk fat (obviously). • Skim milk: .1% to .5% milk fat. Powdered milk: made by evaporating milk to dryness. A powder with long shelf life and no need of refrigeration. Used in the production of many food items by manufacturer’s, occasionally used by the home cook. Sour cream: contains 14% milk fat and is made by “souring” cream with an acidfier. Basically creme fraiche, but leaner and firmer. Sweetened condensed milk: thick, sweet, canned milk product sold in cans; does not need to be refrigerated. It is produced by removing approximately half of the water from whole milk, then adding up to 40% sugar. (There is also a product called condensed milk [unsweetened] but rarely used anymore). Whipped cream: cream (with more than 30% fat) that has been whisked/had air mixed in to form a soft solid (versus natural liquid state). Yogurt: ”‘Yogurt’ is the Turkish word for milk that has been fermented into a tart, semisolid mass” (McGee.) Today’s industrial version of yogurt is cultured using only 2 strains of bacteria and can be cultured from whole, low-fat, or nonfat milk. Yogurt cheese: made by draining yogurt in cheesecloth. Low-fat alternative to cream cheese. Notes: 1) milk fat & butterfat are used interchangeably above. ; 2) The higher the fat content of the cream, the richer it will taste and the less likely it will be to curdle when heated. Avocado oil -and- grape seed oil: light flavor. They have the highest smoke point of any oil, making it excellent for frying or sautéing over very high heat. However, more expensive and usually only found in speciality shops. Canola oil: mild flavor, inexpensive. Due to higher smoke point (400 degrees) and neutral flavor, good for frying (and stir-frying) as well as baking and salad dressings. Good choice for an all-purpose oil. Lowest level of saturated fat, one of the highest levels of heart-healthy monounsaturated fat. Becoming more popular. Corn oil: produced from corn kernel germ. Almost tasteless and odorless. Due to high smoke point (450 degrees), corn oil is one of the best for frying. However, tendency to foam and produce smoke makes it unsuitable for very high-temp recipes. Often used by manufacturers to produce margarine and shortening products, as well as vegetable oil. Flax seed oil (aka linseed oil): while previously not well-known, I’ve seen more and more recipes with flax seed oil, and people recommending it. In fact, it’s a nutritional supplement. Do NOT try to fry or sauté with this; it’s smoke point is 225 degrees. It’s better used in salad dressings or other condiments. Nut oils (almond, argan, hazelnut, macadamia nut, walnut, etc. ): each oil has its own unique taste, and is used mostly in speciality cooking. They are expensive, fairly hard to find, and must be stored properly (or they will go rancid). Smoke point varies upon type of nut. Best for cold dishes; heating can destroy the flavor. Olive oil: beloved by many a cook and baker. I tried to find out if more vegetable oil or olive oil is consumed in the U.S., but couldn’t. Most olive oils have a fairly strong taste; while they can be used as a substitute in many recipes, it isn’t always a good choice. Note that smoke points vary depending upon manufacturer, process used, etc. -Extra virgin olive oil– unrefined. best flavor of all the grades, high in monounsaturated fats, flavor depends upon olives & growing conditions. Has a low smoke point (between 325 and 375 degrees), so do not use for high-temperature cooking. Acidity must be below 1% to qualify. -Fine virgin– unrefined. Acidity must be below 1.5%. Less expensive. -Virgin- unrefined. Acidity must be below 2%. Less expensive and higher smoke point (approx. 420 degrees) allows for wider variety of uses. -Semi-fine- unrefined. Acidity must be below 3.3%. –Olive oil (aka Refined olive oil) – Less expensive. Much higher smoke point (438 degrees), making it ideal for cooking. -Extra light- very refined, less expensive, neutral taste. Smoke point approx. 468 degrees. Peanut oil: very widely used. High smoke point (450 degrees) makes it ideal for sautéing and frying food. American version is well refined, leaving it clearer and with a milder taste. “Regional” oils (mustard, palm, sesame seed oil, tea oil, etc. ): in this case, regional refers to wide swaths of the world, such as the Middle East or India. For example, mustard oil is commonly used in Indian cooking. Safflower oil: Very high smoke point (510 degrees) makes it excellent for sautéing, stir-frying, and frying . Used to make margarine and vegetable oil. Soybean oil: while you probably won’t run across it in the grocery store, this oil is one of the most widely used in America. Used to make vegetable oil, margarine, and shortening. Vegetable oil: a broad term, meaning it consists of one or more types of other oils, such as soybean, corn, safflower seed, cottonseed etc. Refining process designed to produce oil with a high smoke point (depending upon types of oil in mixture, 400 to 450 degrees). Thus vegetable oil is good for sautéing, frying, and baking. (Do NOT use as condiment, such as in salad dressings). I haven’t run across these in cooking or baking yet, thus don’t feel a long explanation is necessary. If you need any of these (or other speciality oils) in cooking, make sure you look up the important information before you use: smoking point, flavor, uses, etc. *If you’re making something such as cookies that requires the creaming/fluffing together of the softened butter and sugar, I would NOT recommend substituting oil. The incorporation of air is vital for the proper texture of the final product. If a recipe does call for oil, make sure you use one with neutral flavor (canola, corn, safflower, etc.). *The science behind using oil in cake in place of butter: “Oil coats flour proteins better than butter. Coating the flour proteins prevents their forming gluten, which ties up water, thus leaving more water in the batter to make a moister cake” (Corriher, S.O. (2008). BakeWise. New York, NY: Scribner). I don’t often quote sources directly, but she is a genius. Don’t substitute all of the butter for oil; try half. First thing to know, use unsalted butter. I had no idea when I started baking, but recipes will be based on this. And if you like to buy stuff on sale and with a coupon (as I suggest! ), butter freezes well for up to 6 months. Also, use stick butter (versus butter sold in tubs). The stuff in tubs has a higher ratio of water and/or air and will affect your final product. Browned butter: made by cooking butter over low heat until it turns a brown shade. Clarified butter: butter without the milk solids and water; can be heated to high temperature without going rancid or smoking. Made by heating butter on low temperature, then skimming milk solids and water off top. European butters: have a slightly lower moisture content. Ideal for buttercream, but might need to adjust recipe. Lard: rendered pork fat. Used to get flaky pie crusts. Some cooks (including myself) mix butter and lard in the crust to get flavor and some flakiness. Margarine: butter substitute made using vegetable oils or animal fats. Don’t use it. Just don’t. Salted butter: solid fat churned from milk; salt added. Scorches more easily than unsalted butter; often has higher percentage moisture than unsalted butter. Shortening: a solid fat made from vegetable oil. Sold in both plain and butter-flavored varities. Does not contain water, so if using as a substitute for butter, adjust recipe to include some extra water. (Add 1 & 1/2 tsp. water per 1/4 C. shortening). Unsalted butter: solid fat churned from milk. It has no added color or salt, and a lower percentage of moisture than salted butter. Ideal choice for baking and cooking. Whipped butter: 40% air. Do not substitute in baking unless you measure by weight instead of volume. Air whipped in to give it texture and make it smoother for spreading. *Different fats are not interchangeable without seriously affecting the final product. When making cookies, stick with butter. It does multiple things: provides moisture and makes the cookie tender, add flavor, and browns better than other fats (giving cookies a golden color). Do not substitute oil. In other recipes, oil can be substituted in part or in whole. Cakes in particular might turn out moister if part of the butter is replaced with oil. You lose flavor, though. All-purpose flour: this flour is a blend of soft and hard wheats. It comes both bleached and unbleached. Some bakers use unbleached, simply because it has undergone less chemical processing. Other bakers recommend using bleached for cookies and pie crusts, and unbleached for breads. U.S. flour is generally enriched. Self-rising flour: all-purpose flour with additional leavening agents. Never use self-rising flour unless specifically directed by a recipe. One cup contains 1 & 1⁄2 teaspoons of baking powder and 1⁄2 teaspoon salt. Used mostly for biscuits. Bread flour: unbleached flour made from hard wheat. It has a protein (gluten) content of 12-14%…the higher gluten works perfectly for lighter, more elastic bread. This is the perfect and best choice for yeast breads. Cake flour: bleached flour made from soft wheat. Higher starch content, lower protein content of 8-10%, and milled very finely. This flour is best for cakes, pastries, and some muffins. If a recipe calls for it, definitely use it. (While some sources also call this pastry flour, it technically is not). Must be sifted before use. Pastry flour: bleached flour made from soft wheat. Somewhere between cake flour and all-purpose flour, aka- medium protein content. Used mostly for pie crusts. Whole-wheat flour: flour made from entire whole wheat berry, including the bran and germ. Low gluten level makes difficulties in bread making, so it is generally mixed with either all-purpose or bread flour. Bakers may also try adding additional gluten. Makes heavier and more dense products. Also called graham flour. Gluten flour: usually made from hard spring wheat, and has starch removed. High in protein and low in starch. Used in diabetic and other special-diet breads. Semolina flour: made of the finely ground endosperm of durum wheat, the hardest type of wheat grown. Used for pasta making. (Semolina meal is a more coarsely ground product, and should not be used interchangeably). Spelt flour: also known as spelt wheat. Higher nutritional content than regular whole-wheat flour, and widely used by those who have trouble digesting whole-wheat flour. Thus again, a special need flour, though a popular one. Cracked wheat- made from complete wheat kernel. It can be ground fine, medium, or coarse. Added to other flours/breads; it is not used alone. Bulgur wheat- made from complete wheat kernel, though it is first soaked, cooked, and dried. Wheat germ- part of the wheat kernel, but a by-product of the milling process. Some recipes call for this to be added to improve fiber and nutrition (and color). Bran- made of outer layer of wheat kernel. High in fiber and sometimes added to baked goods. Crushed wheat, rolled wheat, farina, etc.- specialty goods that are used very rarely, if ever, by the average baker. In the case of non-wheat flours, many recipes call for a specific flour because it is fundamental to the recipe. Rye bread isn’t “rye bread” without the rye. Cornmeal is essential to cornbread. That being said…for many recipes, there are substitutes you can use if you find a recipe you love but can’t find a speciality grain. In addition, many of these contain little or no gluten, so using them to make raised bread is a challenge (or impossible, depending upon gluten content). Barley flour: barley was the primary cereal grain of the ancient Middle East. Widespread use throughout history despite it now being a minor food in the Western world. Low in gluten, but does contain some, making it a useful alternative to wheat flour. Buckwheat flour: native to Siberia and despite the name, buckwheat is not related to wheat. (Yes, I know, I’m shaking my head also). In fact, it’s not a cereal or grass; it’s a wild fruit related to wild rhubarb. High in fiber, protein, and other nutrients, and low in gluten (or sometimes gluten-free). Used to make a variety of baked goods and substituted for bread flour in recipe (but for no more than half of total flour content); also good in pastas and pancakes. Chickpea flour (besan, gram flour): made from ground chickpeas (versions include using raw and roasted). Can be made at home by lightly roasting dried garbanzo beans, then grinding in blender until they have the consistency of flour. No gluten, higher protein than many other flours. These can be a confusing issue due to international difference in word usage. In addition there are five basic types of corn. • Corn flour (in the U.S.) is what it sounds: corn meal ground down to a flour texture. White corn flour can be blended with wheat flour to reduce gluten in various recipes. Can be made at home by using a blender to grind down corn meal until it reaches flour consistency. Using a substitute depends upon the recipe you are using it for. If you are using corn flour for bread, feel free to substitute wheat or white flour. For breading, white flour. • Corn meal (in the U.S.) is corn coarsely ground (down to .2 mm across), used to make a variety of things, including corn bread. Less coarse than grits, more coarse than corn flour. • Masa: corn is milled, wet, after undergoing preliminary cooking. Stone ground to produce a dough-like material. Made into tortillas, tamales, and corn chips. • Masa harina: flour made by flash-drying freshly made masa particles. Is used to make corn tortillas and tamales. • Grits: corn coarsely ground (particles between .6 and 1.2 mm across). Coarser than corn meal. • Blue cornmeal: ground from a variety of flint corn; ground from whole blue corn. • White cornmeal: same as regular cornmeal but ground using white corn. • Hominy: kernels of corn are soaked in alkaline solution; hull and germ falls off and grain doubles in size. Rinse away hull, germ, and solution, and you are left with hominy. Note: Corn starch (in the U.S.) is a starch obtained from the endosperm of the corn. Often used as a thickening agent by cooks and bakers. In the U.K., it is called cornflour (one word), which I am including it in this post on flours. Corn meal goes by the name of maize flour overseas. Local usage will vary. Millet flour: millet is name used for a number of different grains, their common trait being very small, round seeds. Ground into flour; has high protein content. Oat flour: Rolled oat can be ground into either a oat flour or a coarse meal. Can be made at home by grinding oatmeal in blender until it reaches consistency of flour (1 & 1/4 C. oats will produce approx. 1 C. oat flour). Hard to substitute for without taking into account dish. Best option is to substitute equal weight (not volume) of another gluten-free flour. Quinoa flour: quinoa is a native of northern South America. Ground, it is made into a variety of flatbreads. Can be ground from milled or unmilled seed. 1 C. = ¾ C whole quinoa, ground in a blender until it has the texture of fine cornmeal. Rice flour: made from finely milled rice, either brown or white. Is unique in being almost 90% starch and smallest starch granules of major cereals. Thus it has a fine texture making it idea to make rice noodles and desserts, among other things. There are thought to be more than 100,000 distinct varieties of rice throughout the world (McGee, 2007). 1 C.= 1 C. cake flour, especially if rice flour is being used to “soften” the texture of a baked good. Rye: substitute doesn’t really exist, but buckwheat is probably the best choice. • Light: white rye flour is made from grinding the center endosperm of the rye berry. • Dark: flour made from grinding the outer endosperm of the rye berry, which contains more of the coloring pigment from the berries. (An unauthentic alternative that is also used is using white rye flour and adding molasses, cocoa, or instant coffee to darken it). • Pumpernickel: flour made from coarsely grinding the entire rye berry. Sorghum flour: type of cereal that is tolerant of drought and heat, making it a staple in parts of the world. Notes: This is widely used in India and Africa, especially by poor farmers who can’t afford wheat flour. It’s somewhat bland but very nutritious and gluten-free. You can sometimes find it in health foods stores, but you can get it for less in an Indian market. Spelt flour: cereal grain that looks similar to wheat; also has tastes similar. Due to gluten content, good for substituting in place of wheat flour in recipes. Gluten is different though, and requires much less kneading/mixing. Teff: tiny grain from Ethiopia region that has spread throughout world. Used both ground as flour and unground in other cooking. Can be made at home by grinding teff in a blender until it reaches consistency of flour. *There are also a number of nut flour and meals in existence. I have never actually seen them used in a recipe, hence it is beyond the scope of this website. In a pinch, take the nut in question, toast them slightly. Then add a touch of sugar or flour (1 Tbsp. to 1 cup nuts; to help absorb the oil) and blend it & the nuts together until it reaches flour consistency. Firstly, there are over 30,000 varieties of wheat today. In fact, wheat is actually a sprawling group of species, with varieties within each species. They are classified differently by different countries, groups of people (aka- botanists versus farmers), etc. Let’s break down some of the most common classifications you’ll see: winter/spring, red/white, and hard/soft. Most wheats you see in stores for purchase will be labeled with a combination of those labels. Winter or spring wheat? This refers simply to the plant’s response to cold weather, and is based on the season in which the crop is grown in the Northern Hemisphere (so winter wheat is winter wheat even when grown in March in Chile, South America). • Winter wheats– winter wheats require a period of cold weather- several weeks- called vernalization before they can fully flower. They are planted in the autumn, germinate and develop into small plants that go into a vegetative state over the cold period, and then resume growth in the spring. • Spring wheat- spring wheats are wheats that do not require the period of cold (vernalization) required by winter wheats. They can actually be planted year-round depending upon climate. (So they can be grown in the fall in warm-termperature climates, but are still called spring wheats). Red or white? This is a division based on kernel characteristic; color determined by pigment found primarily in the bran. • Red wheats– red pigmentation in the bran layer carries an astringent flavor, thus darker in color and flavor. • White wheats– lacks the red pigmentation in the bran layer, thus lighter in color and flavor. Hard or soft? This is a division based on kernel characteristic. Both hard and soft can be red or white. • Hard wheats– hard wheats have more gluten and more protein (thus critical for yeast-leavened baked goods); and are used to make breads, rolls, and all-purpose flour. • Soft wheats– soft wheats have less gluten (and higher percentage carbohydrates) and are often used for cakes, pastries, muffins, cake flour, and pastry flour. Can be red or white, and is almost always winter wheat. Those descriptions aside, here is where it gets a bit more confusing. You don’t go to the store and buy “winter wheat.” You go to the store and buy one of the many combinations! • Hard red spring– one of hardest kinds of wheat grown, highest protein (13.5%), brownish in color; used for: bread, hard baked goods, pizza dough, bread flour, other high-fluten flours. Grown primarily in Dakotas, Minnesota, Montana, and Canada. • Hard red winter– hard, protein roughly 10.5%, brownish in color; used for bread, hard baked goods, and unbleached all-purpose flour. Often used with other flours to increase protein in pastry flour. Taste is also mellow enough to be used in other baked goods, such as muffins and scones, if needed. Grown primarily in Plains. Good choice for home grain mills. • Soft red winter– lower in protein; used in making pastries, cakes, pie crusts, pan bread, pastas, cake flour, and pastry flour. Being soft, easier for most grain mills to grind than the hard varieties. • Hard white spring- high protein content (thus gluten), good for yeast-leavened baked goods. Light color and flavor. • Hard white winter– similar protein to hard red; but sweeter, neutral flavor. Used in pan breads and Asian noodles; good choice for home grinding. • Soft white spring- grown primarily in the East and Canada. Used in pastries and cakes needing softer flavor and coloring. • Soft white winter- growing in popularity. Usually must special-order or online-order, but as popularity grows, availability also should. • Hard white- grown primarily in dry, temperate climates. Hard, light-colored, opaque, medium-protein wheat; used for bread and brewing. • Soft white– grown in Pacific Northwest as well as other temperate, moist areas. Soft, light-colored, very low protein wheat; used for pie crusts, pastry, and pastry flour. • Hard winter- grown primarily in Texas, Oklahoma, Kansas, Nebraska, and other prairie states. Protein content ranges between 10–12%. • Hard spring- grown primarily in the Dakotas, Minnesota, Montana, & Canada. Generally, the farther north you go, the more spring wheat you’ll find and the greater the levels of protein—generally 12–14%. • Soft winter- grown primarily east of the Mississippi: Missouri, Illinois, east to Virginia, the Carolinas, and New York. • White spring- grown primarily in the Pacific Northwest. Preferred by millers due to more flour per ton of wheat. Most wheat exported from the West Coast to East Asia is white, because noodles made from red wheat tend to be gray. • Durum– actually a different species (triticum turgidum) than common wheat (triticum aestivum). Used in most dried pasta, many flatbreads, and semolina flour. Hardest wheat, highest in protein (though low in gluten), translucent. Grown primarily in North Dakota. Leavening Agents: Baking Powder, Baking Soda, Yeast, Etc. Double-acting baking powder: compound leavener. Includes the baking soda, but also has a moisture control/stabilizer (usually cornstarch) and an acid. It reacts twice: first when moistened with the liquids in the recipe and second when heat is applied in the oven. This is the one you will most commonly use. Single-acting baking powder: reacts only once (with the liquid ingredients). No longer commercially available, but preferred by some bakers. Note: there technically are more types of baking powders based on the acid used, but as double-acting baking powder is what is “normally” called for, I’m not going to get into the chemistry. Baking soda: bicarbonate of soda. Alkali. Creates carbon dioxide gas when combined with acidic ingredients (such as buttermilk, yogurt, sour cream, citrus, vinegar, cream of tarter, brown sugar, molasses, chocolate, natural cocoa powder, etc.). If a recipe calls only for baking soda, there MUST be an acid ingredient to activate it. Must be baked immediately after mixing. Cream of tarter: naturally fermented leavener found in the bottom of wine barrels. Combined with baking soda to make single-acting baking powder. Will keep indefinitely if stored in airtight, cool, dry area. Self-rising flour: flour that already has the chemical leavening agent (baking powder) and salt already added to it. Yeast: single-celled microorganisms in the fungus family. Yeast is activated by moisture, warmth, air, and something to feed on. There are multiple strains of yeast used for various things (baking, brewing beer, wine production, etc.). The yeasts below are all used for various baking purposes. Note that the main difference is in moisture content, and that they are considered interchangeable WITH allowances for liquid content in recipe and temperature. Active dry yeast: most common type of yeast. Sold in .25-ounce packets (three in a strip) or in jars. Brownish granules. Store in tightly covered container in refrigerator. [Note: Some sources say you can store in the freezer for up to a decade. Use: Needs warm water to be activated (105°-115°F). This yeast is more sensitive to thermal shock. Let come to room temperature before proofing. And make sure water is no hotter than 120°. Some recipes may not call for you to proof the yeast, but I (and many other bakers) always do. Compressed fresh cake yeast (aka: cake yeast, compressed yeast): this is becoming increasingly hard to find as dry yeasts replace it (stores prefer dry as it has greater shelf-life). Sold as small foil-wrapped cubes at stores. 1 lb. blocks might be available at local bakeries. Highly perishable. Tan-gray color. Store at around 30° F. Will stay fresh for approximately 2 weeks wrapped in plastic. Use: Dissolve in tepid (80°-95°F) liquid before adding to dry ingredients. Some bakers swear that this yeast makes a serious difference and is better than dry yeast. (I personally haven’t tried it). Instant dried yeast (aka: instant yeast, quick-rise yeast, rapid-rise yeast): lower percentage moisture and smaller particles than active dry yeast. Sold: one-pound vacuum-packed bags. Also sold in .25-ounce packets (three in a strip) or in jars. Use: Can be added directly to dough; does not require rehydration. Allows dough to be baked without initial rising time. In other words, you can shape the dough into loaves and simply allow it to rise once. There is an ongoing debate over whether ‘rapid-rise’ and ‘instant’ yeast are the same thing. Fleischmann’s flat out says there is no difference. Since they produce most of what I buy, I’m going to take their word. There is another debate over whether active dry or rapid-rise is better. Most cooks prefer active dry. The extra rise is needed for great bread. A few disagree. Bread machine yeast: finely granulated and coated with special buffer. Allows for it to be mixed directly into other dry ingredients before liquid is added and less sensitive to temperature changes. Don’t use unless you’re using a bread machine. (Don’t use that…please? Homemade is better). Deactivated yeast: not interchangeable with other yeasts. It is a dead yeast that technically doesn’t leaven. It is used with pizza and some pan bread doughs. It increases the “extensibility” of the dough. Use of steam and air to leaven is almost universal in cooking and baking. This is simply air that is naturally captured in the batter during the mixing process that expands while the product is cooking. Mechanical leavening: the process of ‘beating’ or ‘creaming’ air into a product. You cream together butter and sugar for cookies and sugar and cream cheese for cheesecakes. This incorporates tiny air bubbles into the mixture. Whisking creates foam by adding air into the ingredients. Beating eggs is also incorporating air. Exact measurements of baking powder and soda are important! A small quantity (over or under) can seriously affect a recipe. They are not interchangeable! Exact measurements are very, very important when making cookies. Leaveners have multiple effects on cookings. They affect rising, taste, browning, and how much the cookies ‘spread out’ as they bake. Use no more than 1 & 1/2 tsp. baking powder to 1 C. of flour. If doubling or tripling recipes, cut back amount of leavener by one quarter. High altitude requires reducing amount of baking powder by half. (There are special instructions for reducing baking soda). Baking powder has short shelf-life: 4 months. To test, place a teaspoon of baking powder in a 1/3 C. of hot water. If it bubbles ‘enthusiastically,’ it is still fresh. To test baking soda: mix 2 tsp. white vinegar and 1/4 tsp. baking soda. If it bubbles up immediately, it is still fresh. A good potion of the “rising power” is from non-chemical/non-yeast leaveners. That is why it is important to pre-heat the oven. And if the recipe calls for beating the eggs, the eggs really need to be beaten. Canning/Pickling salt: very fine granules of rock salt that dissolve quickly; pure granulated salt (sodium chloride). As name implies, used for canning, pickling, and preserving foods. Also used for brining. Being more fine, you use much less than regular salt, though. Does not contain iodine or any other additives (including anti-caking agents). Fleur de Sel: more expensive salt. Raked from coastal sea ponds in France. Delicate flavor with traces of sea mineral taste. Delicate, irregular crystals; pinch and then sprinkle over food (aka: use as finishing salt). However, if you can (or want to) afford it, it can be used for all cooking. Kosher salt: Coarse texture; becoming more popular among cooks as dissolves fast and disperses flavor well in dishes. However, with its lesser volume, more needs to be used. Note that kosher salt does not necessarily meet Jewish Kosher requirements; its name comes from its use in making meat kosher by helping to remove the surface blood. Rock salt: large, chunky crystals, (obviously) mined. Used for making ice cream (and de-icing roads!). Sea salt (crystalline): Can come as fine or coarse texture, so check the label when buying. As it is (obviously) drawn from sea water, there are natural impurities that will affect the taste. Depending upon type (location “mined”), there will be different tastes. Great for adding flavors to food. Sea salt (flaked): soft, sheer, pyramid-like flakes. Fastest dissolving of all salts; use as a finishing salt. Sel Gris (gray salt; Celtic salt): naturally coarser, raked from bottom of the salt-pan. Sold both as crystals and a fine-ground. Used both for cooking and finishing. Pink Himalayan, Red Alaea Hawaiian salt, etc. Some people find a taste difference with speciality salts; most do not. Most of these are just “finishing salts” meant to add color to a dish at the end and not impart any flavors. There is a Morton conversion chart for interchanging different types of salts at: http://www.mortonsalt.com/for-your-home/culinary-salts/salt-conversion-chart. Cane syrup (golden syrup): made by evaporating sugar cane juice until thick and syrupy. Often used in British, Caribbean, and Creole cooking. Worth finding if cooking a speciality dish. Corn syrup: made from cornstarch that is converted into corn sugar and then turned into a liquid. Used in icings and candies. Adds moisture and smoothness to baked goods. -Light: clarified and flavored with vanilla; used in baking (can be used interchangeably with dark). -Dark: more pronounced caramel flavor (can be used interchangeably with light). Honey: nearly the same, in terms of sweetness, as granulated sugar. Flavor is determined by the type of flowers harvested by bees: thus you can find some very creative honeys to use. (Lavender honey is particularly popular here in WA state where I live.) However, as it is of a different substance (liquid rather than granules), it will have an effect on how the product bakes. In particular, use caution with making cookies. It is difficult (and impossible with some recipes) to get light, fluffy cookies if you substitute honey. Maple syrup: boiled down sap from sugar maple trees. Make sure you buy “pure maple syrup,” not flavored corn syrup. General rule: the lighter the color, the milder the flavor. Molasses: residue/by-product created during the sugar refining process. The juice that remains after sugar crystals are removed is boiled down further to create molasses. Sold sulfured (stronger, more robust flavor) and unsulfured (milder and lighter flavor; best choice for baking). Three strengths: light, dark, and blackstrap. Most recipes will use light. Sorghum: made from sorghum cane juice. Often used in South (of United States). Syrups, misc. : you can find syrups from a variety of products: almond, coconut, and rice are just a few. Should a recipe call for it, look in a speciality market -or- look online & find a substitute. Treacle: comes in light or black. Easiest to find in United Kingdom. Basically the same as molasses. *A rough substitute guide is to substitute honey or other liquid sweetener for granulated sugar, use 3/4 C. honey per 1 C. sugar -and- reduce the total liquid in the recipe by 1/4 C. (if no liquid is called for, add an extra 1/4 C. flour). Make substitutions with caution, though, as the “make-up” of the ingredient (such as sugar being granulated) greatly affects recipe results. Brown sugar (light or golden brown): a combination of granulated sugar and molasses. When measuring, it must be packed due to high air content. Lower molasses content gives it a lighter caramel flavor. Can be used interchangeably with dark brown sugar, if needed. Brown sugar (dark): a combination of granulated sugar and molasses (dark has more molasses than light). Higher molasses content gives it a stronger, more intense flavor. Can be used interchangeably with light brown sugar, though. Coarse sugar (decorating sugar/ crystal sugar): as name implies, coarse sugar. Used for decorating baked goods. Doughnut sugar (snow sugar/ non-melting sugar): sugar mixed with cornstarch to prevent it from melting on baked goods. (You still need to cool the recipe before applying, though). Used only in speciality situations/by professionals. Granulated sugar (white sugar): highly refined cane or beet sugar. When recipes call for “sugar” (with no other description), this is generally the type of sugar they are referring to. As a matter of taste preference, I recommend buying 100% pure cane sugar (for both white and brown sugars). It is generally clearly labeled; if not, it’s probably made from sugar beets. Powdered sugar (confectioners’ sugar/ 10X sugar/ icing sugar): made by crushing granulated sugar to 10 times finer than normal (to a powder) and adding cornstarch (abt. 3%). When measuring, it is best to sift before using. Used for icings, frostings, glazes, and candies, as well as in decorative dusting a dessert. Should NOT be substituted for/with granulated sugar (but if you absolutely must: 1 & 3/4 C. packed powdered = 1 C. granulated). Raw sugar (turbinado sugar): made from first pressing of crystallized sugar obtained in refining process. Dry, pourable, blond sugar. Used a decorative dusting for tops of cookies. Can NOT be substituted for/with granulated sugar. Rock sugar: comes in lumps, hence name. Sugar cane is cooked until is just begin to color. Occasionally called Chinese sugar or Chinese rock sugar and used in some Chinese cooking and to sweeten tea. Superfine sugar (bar sugar): extremely fine-grained sugar (finest granulated that is sold commercially). Used by bartenders & baristas to make mixed drinks & coffee drinks as it dissolves almost instantly. Good choice when extra-light, super-smooth texture is important, such as in meringues. Called caster (or castor sugar) in U.K.
Do I sift flour before measuring? Is sugar supposed to be packed? Are liquid and dry measurements the same? What do I do with semi-liquids: dry or wet measuring cups? If you’ve ever had any of these questions, this is the post for you. I’m going to (perhaps exhaustively) cover how to measure ingredients. With the “baking season” coming up (note that baking ingredients will be on sale during November and December), this is a great time to learn or review this information. When cooking dinner, tossing a handful of this and pinch of that often works. Baking is not forgiving of error and mis-measurement. Cookies can be hard as rocks because of an extra teaspoon salt. Extra or not enough flour also affects them drastically. As it does pie crusts. You get the idea: baking is a science. And science requires proper measurements. Note that American measuring is often different from the rest of the world. They often weigh everything, plus often use metric. Don’t forget to check out my “Free Printable Cooking Measure Conversions” for a free printable. I tape it up inside my kitchen cupboard. Out of the way, but I NEVER have to stop baking to find a measurement conversion. In general, you dip the cup in the ingredients then sweep a knife (or any hard flat edge) across the top. The cup should be completely full, but leveled off. Flour is a subject of debate. Professional bakers insist you actually weigh flour. This is because the amount of flour in one cup can actually vary drastically between sifted, fluffed up/then measured in cup, cup dipped into canister/then leveled off, etc. Vary by more than you can imagine. And with flour being the main ingredient in many a baked good, this is important. So, IF you have a scale and don’t mind the extra step, I recommend weighing. 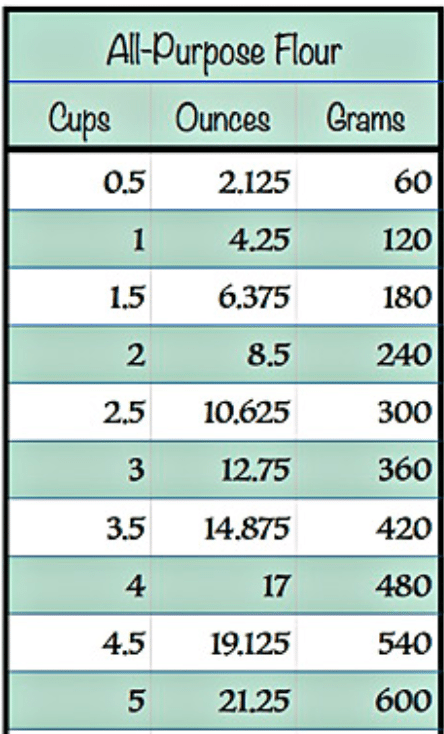 There is a chart next to this that shows common flour (all-purpose, self-rising) and how much a cup should weigh. (Yes, various flours have different values, another reason I’m going to recommend just using a measuring cup). This is a smart part of a graphic “The Bearfoot Baker” (yes, it’s spelled that way) has on her site. Click on either her name or the graphic to be sent directly there. It also has larger flour measures, sugar, and powdered sugar. If you need measures for other types of flours, please check out “King Arthur Flours” handy, exhaustive chart. The weight argument being set aside, I don’t weigh my ingredients. I already have measuring cups out for everything. And I’ve never had a problem. 1. Using a spoon, stir up the flour in the canister a little bit. 2. Using the spoon, scoop the stirred up flour into the measuring cup until it is overflowing. Do NOT pack down the flour, scoop the cup into the flour canister, or tap the cup to get the flour to settle. All result in too much flour. 3. Then use a flat edge to scrape the excess flour off the top back into the canister. -1 cup flour, sifted- you sift AFTER measuring. -1 cup sifted flour- you sift, THEN measure. Brown– pack brown sugar into the measuring cup until well-packed and completely full. Make sure it is leveled off. When you dump the cup out, the brown sugar should be packed enough to retain the shape of the cup. Granulated– this sugar is forgiving and easy. If you haven’t used your sugar in awhile and it has packed down, use a spoon to stir up the sugar in the canister. Scoop the measuring cup in the canister, fill to overflowing. Then use flat edge to level. Powdered sugar (aka confectioner’s sugar)– this one can be slightly confusing. Recipes often call for the sugar to be sifted. But before or after measuring? -1 cup powdered sugar, sifted- you sift AFTER measuring. -1 cup sifted powdered sugar- you sift, THEN measure. For the measuring, it is the same as flour above. Spoon into measuring cup (don’t pack or tap measuring cup), then level off. Full disclosure: I often sift the powdered sugar after measuring even if the recipe doesn’t specify sifting it. It gets rid of lumps and results in a smoother finished product. Leaveners: Baking Powder, Baking Soda, Yeast, Etc. If you skip every other section, don’t skip this one. Leavening agents are the most important ingredients in baked goods and must be measured exactly. Baking powder & Baking soda: before you start measuring, check expiration dates. Both of these go over fairly quickly (4 months and 6 months, respectively) so fresh product is important. Quick tests if you’re not sure: baking powder: place a teaspoon of baking powder in a 1/3 C. of hot water. If it bubbles ‘enthusiastically,’ it is still fresh. Baking soda: mix 2 tsp. white vinegar and 1/4 tsp. baking soda. If it bubbles up immediately, it is still fresh. -Shake up the container slightly in case any settling has occurred. Dip measuring spoon into container, level off. Yeast: again, check the expiration date. Quick test if you’re not sure if it’s too old: sprinkle onto 2 Tbsp. of HOT water (110°-115°). It should start foaming within five minutes. Even if the recipe doesn’t call for proofing the yeast, it shouldn’t hurt to do so. -If you’re an infrequent baker, you probably just buy the little packets that are 1/4 ounce (2 & 1/4 teaspoons). If using a jar or needing a smaller amount, dip the measuring spoon into container (or packet), level off. As with flour and powdered sugar, spoon into measuring cup (don’t pack or tap measuring cup), then level off. I have heard of requiring powder to be sifted, but have never done so. I do use a small spoon to break up and squash any lumps. If the spoon fits in the jar, simply place in the jar, fill, then level off. If the spoon doesn’t fit (a common problem), pour spice from the jar into the measuring cup with a small bowl underneath. Level off. Pour excess spice back into jar. I have a flexible plastic bowl I use with a pour spout. However, if you don’t own such a thing, use a small funnel or fashion a piece of paper into a funnel. For fresh herbs, if the recipe doesn’t specify, very lightly pack. There is a lot of volume between leaves. This category includes items such as chocolate chips, nuts, dried fruit, candy pieces, sprinkles, etc. Either scoop the measuring cup into the the container or pour the items into the measuring cup. Level off. These ingredients are just as they are labeled (add-ins); they don’t contribute much to structure or baking chemistry, hence exact measurements aren’t as important. Some recipes may specified firmly or lightly packed. This is often for ingredients such as shredded coconut or shredded cheeses, which can form large air pockets. If it doesn’t specify, I usually give the measuring cup and good shake and tap. It allows for a small amount of settling. This category includes ingredients such as peanut butter, applesauce, yogurt, sour cream, etc. Use dry measuring cups. If needed, spray a bit of non-stick into measuring cup. Then use a spoon to fill measuring cup. Pack down lightly; this is to prevent any air pockets (a common problem with peanut butter!). Level off. If you’re having trouble getting ingredients out of measuring cup, use a spatula. (Side note: I have a fabulous measuring cup from Pampered Chef that actually allows you to push the ingredients out…I’m not being paid to recommend it. But I recommend it. Plus it has liquid on one side of the cup and dry on the other. It’s amazing). Wet ingredients are measured with liquid measuring cups. They generally have a pour spout. Note that there IS a difference in volume for wet and dry measuring cups. In addition, you need to check level in cups at eye level. Leave the cup on the counter, and lower down to read the cup…don’t lift the cup to eye level. You can’t make sure you’re holding it straight. However, to confuse matters, some newer cups are made so you can read them from above. I simply ignore this fact. Use the above method for oils, water, milk, heavy cream (and other liquid milk products), etc. For sticky liquid items (honey, molasses, syrups, etc. ), lightly spray the measuring cup with non-stick spray before pouring liquid in cup. It will easy pour back out without losing too much to sticking. If you’re going to be very precise, the meniscus the curved upper surface of a liquid. The BOTTOM of the meniscus should be at the measuring line, not the top of it. Another way of describing it: water curves downward. Have the bottom of the curve at the measuring line, not the top. This is fairly obvious…but use real measuring cups and spoons. Don’t use the cups you drink from. Don’t use the spoons you eat with. I admit: I didn’t know the bit about the spoons when I started baking. Our eating spoons are NOT teaspoon and tablespoon size. Make sure you have dry and liquid measuring cups. Never measure over the bowl of mixed ingredients. If you over-pour the salt or vanilla, you can’t remove it from the recipe. I had this issue with vanilla once. Crack eggs open into a separate bowl one by one. Smell and then dump into recipe. I thought it was an urban legend until I actually got a bad egg. Ick. For sticky ingredients, spray non-stick spray into the measuring cup before adding the ingredient. It will be easy to pour or remove. -Or- place plastic wrap in the measuring cup. Fill, then pull out plastic wrap and dump out ingredient. This works well with shortening, which often sticks to the cup and is hard to clean out. Again, I recommend the Pampered Chef measuring cup…it removes this problem.